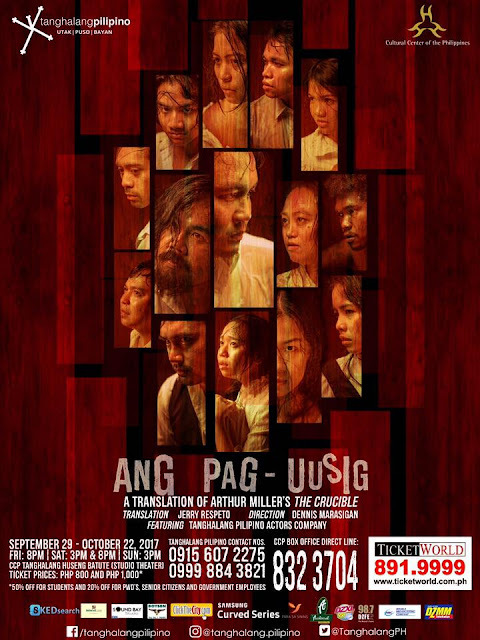 Ang Pag-uusig, a Filipino translation of the Tony Award-winning play “The Crucible” by world renowned playwright Arthur Miller is the second production of TP’s 31st season which will open on September 29, 2017. Playing for four weekends (every Fridays, Saturdays, and Sundays), this classic American drama will close on October 22, 2017. 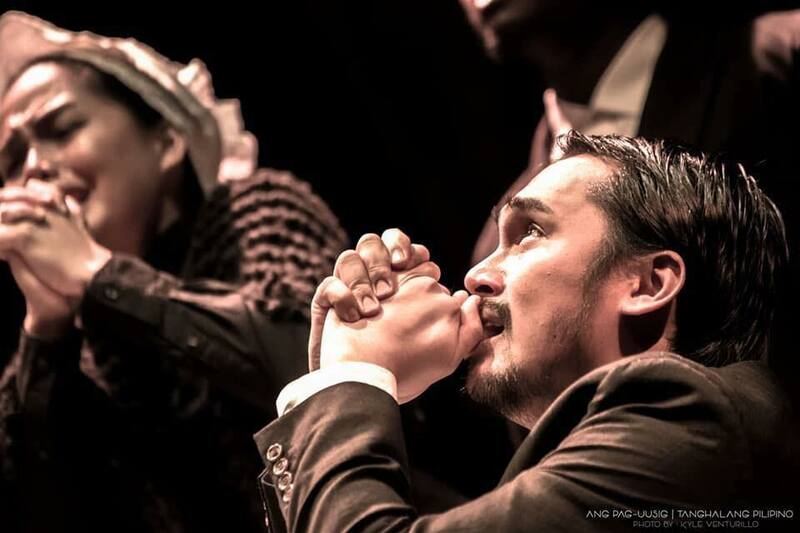 This will be shown at Tanghalang Huseng Batute (Studio Theater) at Cultural Center of the Philippines (CCP). When teenage girls were discovered “trying to conjure spirits,” fear surrounded the villagers of Salem, Massachusetts in 1692. 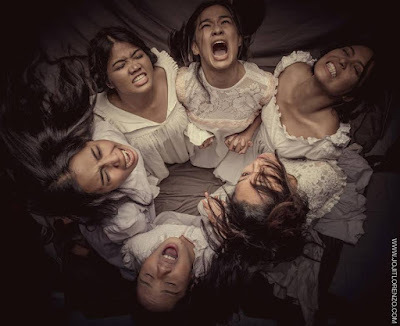 Ang Pag-uusig explores the effects of this terror, paranoia, as well as the destruction of innocence caused by the rabid accusations of witchcraft began by spurned mistress Abigail Williams played by Antonette Go. The villagers became consumed by widespread hysteria – as they waited in fear who will be accused next. 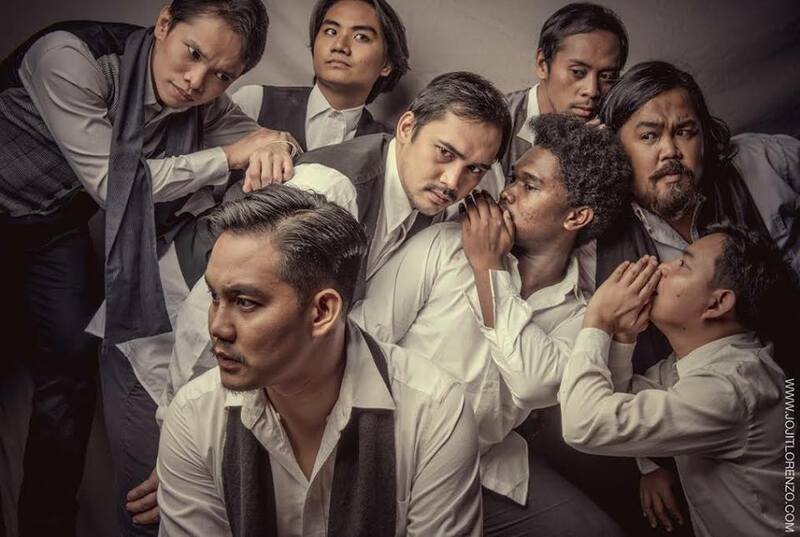 Staying true to Tanghalang Pilipino’s theme of Utak, Puso, Bayan (Mind, Heart, Country), Ang Pag-uusig remains to be a provocative, dramatic, and relevant play of today. 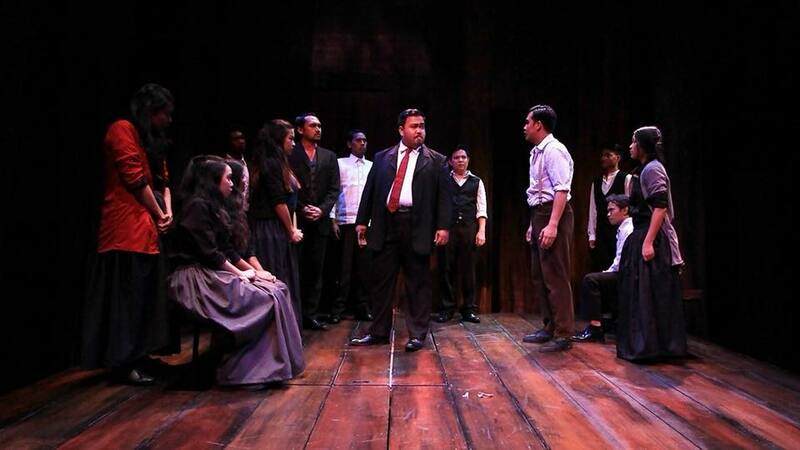 With lives ruined and reputations destroyed, the play shows how apathy and fear allow those who accuse others to rise to power and gain control. Good versus evil, lies versus truth, and jealousy versus compassion and forgiveness are explored by the different characters in the play. The word "pag-uusig," can be translated as investigation (pagsisiyasat, paglilitis), interrogation (pagtatanong, paguusisa), persecution (pagmamalupit, pagpapahirap), or a prosecution (pagsasagawa). Ang Pag-uusig serves as a metaphor for the hysteria and conflicting circumstances the characters find themselves in. Mass hysteria, a phenomenon that transmits collective illusions of threats, whether real or imaginary, through a population in society as a result of rumors and fear – these themes along with issues of integrity and injustice are depicted well in the play. 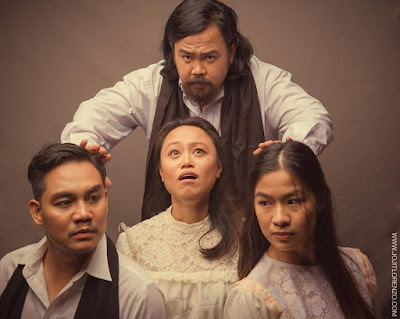 Played by Antonette Go, the smart, beautiful and vindictive Abigail Williams is able to convince the other girls to falsely implicate their neighbors of witchcraft. While working as a servant in John Proctor’s household, the two of them became involved intimately. 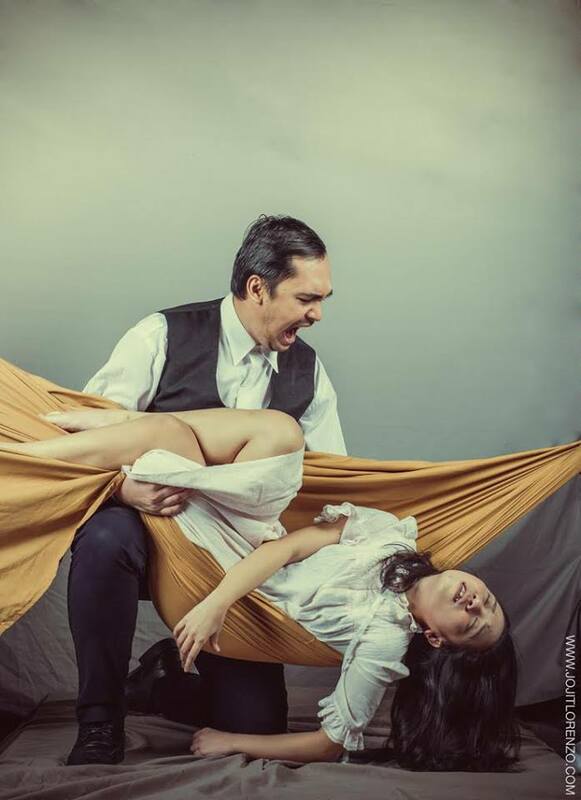 JV Ibesate plays John Proctor, a farmer who in a moment of weakness, had a brief sexual affair with Abigail Williams. He has a powerful sense of personal integrity. For this reason, his affair with Abigail makes him see himself as a hypocrite. In an attempt to hide his sin accusations of witchcraft escalate finds himself condemned to death. Quick to anger, Marco Viaña portrays the Rev. Samuel Parris, Abigail Williams’ uncle and minister of Salem’s church. He is paranoid that someone is plotting against him to ruin his good name. He has a daughter, Betty Parris (Blanche Buhia), a typical rebel teenage who falls into a stupor after being one of the girls caught in the woods having a dance party. Joshua Tayco portrays Rev. John Hale, a scientist and philosopher to confirm the diagnosis of witchcraft for the court. Although coming to a conclusion that the accused are innocent, he advises them to confess to save their lives. 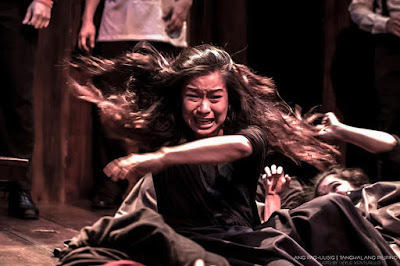 Rhodora Dayao plays the part of Elizabeth Proctor, the chaste wife of John Proctor. Also played by Rhodora Dayao, Tituba is a slave from Barbados who had performed magic rituals for the girls in the woods. Monique Nellas and Ybes Bagadiong play the bitter couple Ann and Thomas Putnam. Putnam seeks to gain the community’s respect by increasing his wealth and influence. His wife Ann fuels hysteria with her belief that the death of her babies had a supernatural cause. Lhorvie Nuevo plays Rebecca Nurse. She is admired for her religiousness and good sense, but she is a victim of the Putnams’ accusations. Mary Warren, also played by Lhorvie Nuevo, is a timid servant girl who replaces Abigail and is influenced to join in the accusations. Deputy Gov. Danforth (Jonathan Tadioan) sits as chief judge in the witch trials and believes he is doing right. Judge Hathorne is played by Daniel Gregorio. Erick Sindol portrays the court clerk, Ezekiel Cheever. Completing the cast, Aldo Vencilao plays Giles Corey, a brave and moral farmer, while Eunice Pacia as Mercy Lewis, the confidant of Abigail and a servant in the Putnam household. The Crucible is a classic, but Tanghalang Pilipino’s Ang Pag-uusig makes use of devised theater as a process for the production. It is a form of theater where the stage direction originates not from a director, but from collaborative, usually improvisatory, work by a group of people – in this case, our Actors Company. This gives a fresh, modern approach on a classic play – the story and emotional impact undeniably felt by the audience which is further enhanced by the intimate box setting of Tanghalang Huseng Batute (Studio Theater). Due to mature subject matter, some scenes and languages are unsuitable for young audiences. Ang Pag-Uusig is rated PG-13. Tickets are PHP 1000 (VIP), PHP 800 (Bleachers), and at 50% off for students. They are available at Ticketworld Online and Outlets with hotline +632 8919999, the CCP Box Office +632 8323704, and the Tanghalang Pilipino office +632 8321125 loc 1620 and +63915 6072275.